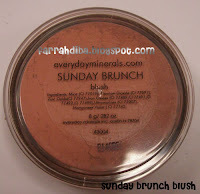 description of sunday brunch from the everyday minerals website: A delicious raspberry sorbet shade that is ideal for all skin types. Just the right matte finish that you can dress up or dress down. A versatile and must have color for every occasion. 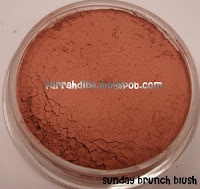 this was the first colour i ever tried from everyday minerals. i ordered it with the sample kit i got to test out my foundation shades and i got hooked right away on the colour. like most of EDM's blush colours, it can be a little too pigmented for lighter skin, so the first time you try it you might want to be lighthanded on the application. on me, i think it's a matte version of my corner office, which is pretty much the colour i wear to work almost everyday. i wear the corner office more though because i like the slight shimmer in it and it makes my face that much brighter in the mornings. i really need that coz i get up at 5.30am every weekday! verdict: a matte colour that would be my standard blush coz i wouldn't have to think too much whether the colour was going to match whatever i wore. the colour blends in really nicely to give me a healthy sunkissed glow.